Opel's future is in the balance. MUNICH -- General Motors Co.'s board will again postpone a decision on Opel's future at a two-day meeting starting today despite pressure from Germany to accept an offer for the European unit from Magna International Inc, a newspaper reported. GM's board will delay a decision until October at the earliest, the German business daily Handelsblatt said, citing company sources. The paper said the board favors keeping Opel or, as a second choice, selling a majority stake to Belgian investment group RHJ International, which is offering 300 million euros ($433 million) in cash for a 50.1 percent stake in Opel. GM signed an initial agreement in May to sell a majority stake in Opel and its British sister brand Vauxhall to a Russian-backed consortium led by Magna. Since then senior GM executives have become increasing worried that Opel under Magna could transfer important technological expertise to the Canadian supplier's industrial partner GAZ, Russia's second-largest domestic automaker and a rival to GM's successful Chevrolet brand in Russia. Opel's Russelsheim operations in Germany also have been the center for developing vehicles that are crucial to GM's vehicle line-up and its effort to deliver better sales of more fuel-efficient cars in the United States. The Chevrolet Malibu and Buick LaCrosse mid-size sedans and Chevrolet Cruze compact sedan are built on Opel-developed platforms. Last month, GM's new board asked executives to look at other options besides selling off the German-based subsidiary, which GM has owned for 80 years. Sources familiar with the negotiations have said that GM is considering raising $4 billion to keep control of Opel. GM could contribute more than 1 billion euros of its own money to retain Opel, while governments in the U.K., Spain and Poland that are home to major manufacturing operations would finance another 1 billion. GM could also raise money by selling or mortgaging the automaker's assets in China, one source said. GM is no longer barred from using funding from the U.S. government to support its international operations, but taking this route could trigger a domestic political storm in the United States. 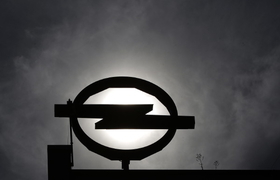 Berlin has said it would provide billions of euros in aid to Opel only if GM selects Magna. If GM rejects Magna, it would have to refinance a 1.5 billion euro bridge loan granted by the German government in May to keep Opel out of bankruptcy and forgo 4.5 billion euros promised by the German federal and the four state governments with Opel plants to help restructure the carmaker under Magna. German Chancellor Angela Merkel is facing a federal election on Sept. 27, and analysts and officials have said it seems increasingly unlikely that a decision on Opel would come before then. After the vote, the political stakes would be lower, giving Berlin more flexibility in negotiations, but even then Merkel would be under substantial pressure not to change tack from powerful conservative allies in states where Opel has plants. Some analysts have speculated that GM's board is holding off on formally approving management's preferred bidder, RHJ, so as not to cause Merkel political embarrassment in the run-up to the election.